What better way to unwind after an exam than scoring on your professors? 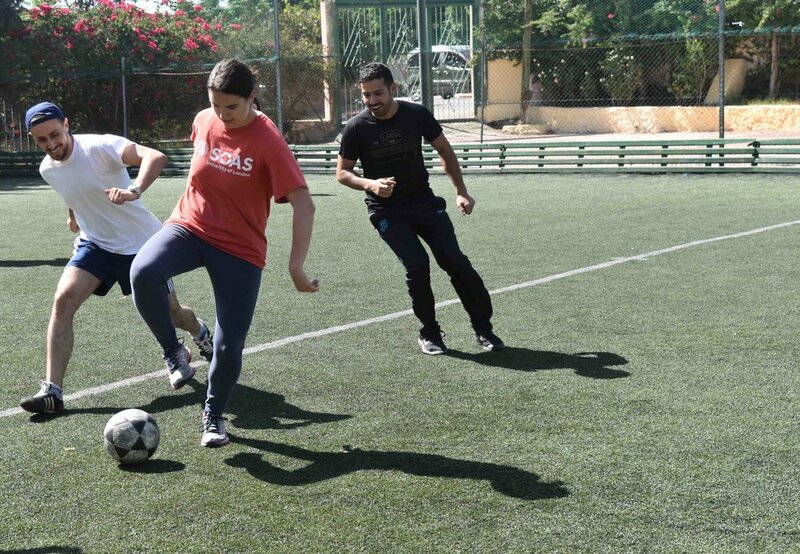 AALIM students, professors, and language partners had a “ball” playing one another in a competitive soccer game. Professors and students cheer for their team as they score a goal. At AALIM, we recognize that students work hard to master Arabic language and culture, which is why AALIM staff plans weekly activities for students to relax and enjoy one another’s company. 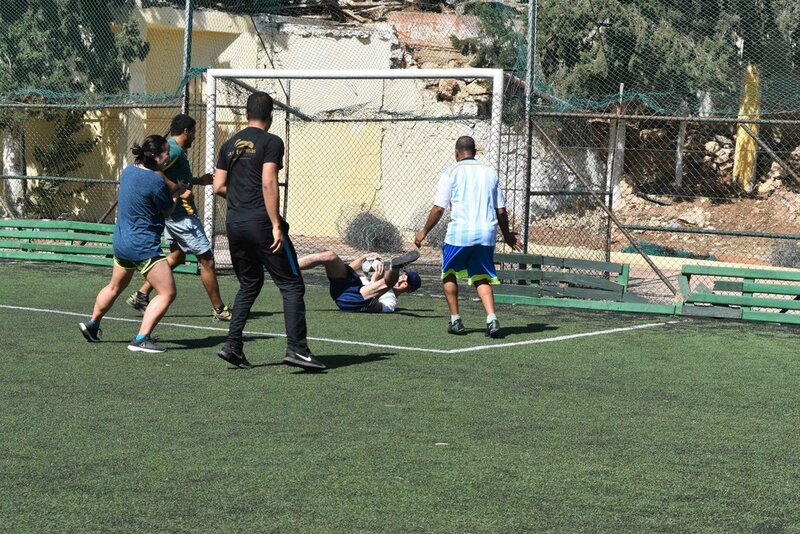 We organize a lot of fun cultural activities, such as baking cookies in the public oven, learning about Moroccan music and dance, and practicing Arabic calligraphy, but we also value organizing events such as soccer games, which play an integral role in both Moroccan and American cultures. Professor Said takes a tumble as he blocks an attempted goal by one of his students. The weather may have been hot, but that did not stop students from scoring on their professors! Professor Amrani shows his excitement after scoring on the opposing team. The soccer field is only a ten-minute walk from the center, making it a fun after-school activity many days throughout the summer. AALIM is close to a recreational center where students have played volleyball tournaments, as well! AALIM staff always welcomes student recommendations for activities, and we do our best to help organize fun events for our students. A student blocks the ball from Professors Said and Amrani. AALIM students know how to travel! We spent our Saturday in one of the quaint beach cities in Morocco to swim in the crystal blue water, play soccer on the beach, ride camels before the ocean, eat fresh seafood, and meander through the narrow alleyways of Asilah. Students were eager to find the ocean upon arriving in Asilah. We quickly ran through the old city (with a brief stop to listen to Gnoawa music) and found this stunning view of the ocean. We made our down the stairs and found our spot on the beach, where we swam for hours. Students Hina Uddin and Alex Yung enjoy a camel ride on the beach. Marzouga meets Asilah! We were surprised to find camels in northern Morocco; nonetheless, many of us took advantage of this unique opportunity. Hina and Alex truly had the time of their lives on their first-ever camel ride. Students smile before one of the many beautiful doors in Asilah. We ended our day with dinner at a seafood restaurant. It was delicious and a day well-spent. Each year, AALIM takes its students to visit Volubilis (known in Arabic as “Walili”) to learn about ancient Roman culture. AALIM students have enjoyed coming to Walili for its well-preserved architecture, colorful mosaics, spectacular views, and rich history. Students sit on the stairs of Volubilis. The story of Hercules as told through mosaic art. Students, professors, and language partners jump for joy before the entrance of Walili. In addition to basking in the picturesque views, students learned from their guide that Walili was famous for its olive oil and wine-making. Students meandered through the city and discovered surprises at every turn, such as ancient mosaics as pictured above. Despite the heat, students had an amazing time with friends and faculty in one of the oldest, most historic sites in Morocco. Located outside Walili lies medina Moulay Idriss Zerhoun, which was named for Sultan Moulay Idriss in 789. Sultan Moulay Idriss is largely credited for bringing Islam to Morocco; thus, many Moroccans cherish medina Moulay Idriss for its religious and historical significance. Students strike their best pose in Moulay Idriss. Students navigated the narrow streets to find the best view of Moulay Idriss. From above, students could see the olive trees, minarets, colorful homes, vast mountains, and all the treasures hidden within Moulay Idriss. Students catch a bird’s-eye view of Moulay Idriss. If you would like your experience to appear on this page as a blog, email it to us! (aaliminstitute2009@gmail.com) Feel free to include photos. We love to hear from our alums. If you simply want to make a comment that will appear here, use the form below. Miloud (in MSA: mawlid an-nabawi) is the celebration of the Prophet Mohamed’s birthday. It is a national holiday in Morocco and falls on Monday, December 12, this year. Although primarily a family holiday throughout Morocco, it is a special occasion in Meknes, where it coincides with a pilgrimage to honor the holy man, Sheik Al-Kamal (Mohamed Ben Issa). This was a famous Sufi who created the Isawa brotherhood in Meknes in the 15th century. 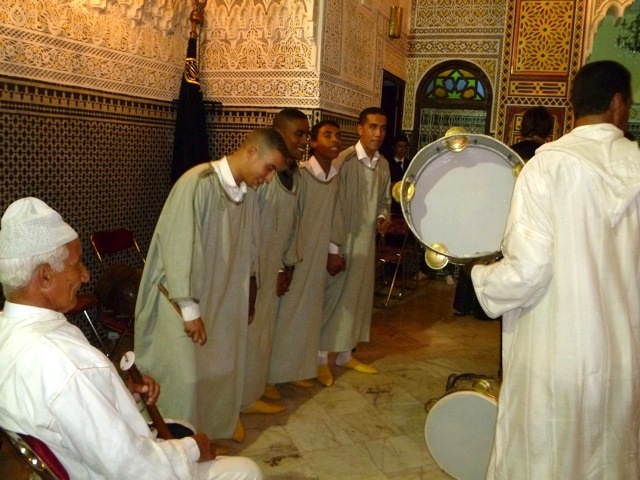 The Isawa are still well known in Meknes and throughout Morocco, particularly for their religious music. To hear some of this music during a party at the AALIM center, click here. On this holiday, people come from all over Morocco, many of them from small Bedouin villages. Every vacant lot in the city is occupied by large canvas tents in which people from the same family or village sleep. Local family and extended-family members in Meknes contribute huge platters of couscous to feed them. There are also restaurant tents and a general atmosphere of carnival or fair time, with stands selling everything from food to clothing, matresses to toys. The pilgrims visit Sheik Al-Kamal’s tomb as well as the cemetery surrounding it; some partake in demonstrations of religious fervor while others simply watch. Pilgrims come fromall over Morocco to honor Sheik Al-Kamal during the MIloud festival in Meknes. Another aspect of the celebration is the famous “fantasia”, a demonstration of horsemanship by Bedouin riders. Originally a demonstration of warriors’ prowess, the fantasia now consists of mounted men in traditional garb who gather at the end of a large empty field and at a signal ride as fast as possible to the other end, where they rein in and discharge their traditional rifles, known in the Moroccan dialect as “bundukiyya”. To see a video of this, click here. The out of town visitors stay in Menes for three days before disappearing as suddenly as they arrived. AALIM has three buildings within minutes of each other in the Old City of Meknes. The original center is called "AALIM Center" and the second is "AALIM Qaa Warda" and the third is "AALIM Annex". The AALIM Center is a splendid, restored riad, or traditional Moroccan home built around an interior courtyard. During the five years necessary to restore it to its former glory–while adding modern amenities such as air conditioning, internet cabling and up-to-date sanitary facilities–master craftsmen worked painstakingly to match, replace, repair architectural details. The results, seen above, are an academic and cultural center that could pass for a museum. AALIM Qaa Warda is a more recently constructed riad, conveniently located right across the narrow street (called a "derb" in Moroccan Arabic) from the AALIM Annex. The Qaa Warda center is beautifully decorated in Moroccan style (below) and its ten classrooms and three offices are equipped with new furniture and computers.The roof of this center has a small snack bar that sells water and simple food at reasonable prices , plus plenty of couches and shaded areas for relaxing. It's a great place to hang out after class and many students take advantage of this space and the wifi to skype their families at home or do homework. A few steps away, a beautiful public garden is home to a small zoo and has an area dedicated to outdoor music and theater productions in the summer. The most recent addition to the AALIM architectural family is the Annex, a bright spacious area across from the Qaa Warda center, which provides extra office and meeting space, a large open floor plan lounge and a computer lab for student use. We use the space for parties, and students use it for informal meetings among themselves as well as for studying. The facility also boasts a very large kitchen which is the site of cooking lessons and the cooking club offered with certain programs. A dozen or more students easily work in the kitchen under the practiced eye of our experienced Moroccan cooks. A great way to practice your language skills as well as learn new culinary tricks! Azrou is located in the Atlas Mountains, close to Ifrane, and features the famous Cedre Gouraud. This cedar forest is home to Barbary macaques, a species of monkey found only in North Africa. Tourists are welcome to sit at benches in the forest and observe these animals in their natural habitat. The monkey population of Azrou is very familiar with visitors and will even eagerly approach strangers (especially if they have food). The staff at the AALIM Center can help students plan and organize travel in Morocco. During my summer in Morocco, I made sure to take advantage of most of the weekends by planning excursions to various tourist attractions. While each destination held its own special charm, my personal favorite trip was to Merzouga in the Sahara Desert. Merzouga is a small town on the edge of the desert inhabited by camels and Berbers. Its orange landscape and clay buildings stand in stark contrast to the beaches in the north and the rocky Atlas mountains between those beaches and the desert. Prior to our departure we booked accommodations in town. Most of the hotels offer rooms and various camel trek packages. We opted for the package that included the camel trek to a Berber camp in the desert, a night in the desert, a view of the dunes at sunrise, and a camel ride to return to the hotel. Upon arrival at the Camel's House, we met our guides, Hassan and Mohamed. The accommodations were perfect for a nap and, in true Moroccan style, they offered us plenty of food. We took some time to relax after the long bus ride and the copious food, then headed out to the local gift shop. I highly recommend checking out some Berber wares if you decide to visit the Sahara. The shop was more like a warehouse, with clothes, jewelry, rugs, furniture, and more. This experience will give you a chance to practice your haggling skills! About an hour before sundown, we set out on our trusty camels for a night under the desert sky. Hassan and Mohamed kindly arrange our blue headscarves so that we could ride in true Berber style. At the desert camp, we drank tea, ate Berber tagine, and went sand surfing. I don't want to spoil the magic of the trip by providing details, but we ate, sang, and definitely did not sleep all night long. I will never forget the unbeatable stargazing I experienced during my night in the desert.